This post is by guest writer Michael Spiteri. There is no louder cry from the gaming community than that of innovation. Fans are seeking fresh, new experiences from the seemingly stale medium, with creativity often considered a rare, fleeting resource. Now, there’s no doubt that true innovation is scarce across all entertainment mediums, and of course, gaming is no exception. The use and reuse of ideas is a product of necessity, designed to keep the gears turning, and ensure the industry stays afloat. This isn’t inherently a bad thing; it allows the truly innovative to stand out from the pack, and ensures a constant stream of new material to consume. There are absolutely negative consequences, but a trade-off is necessary to ensure the medium remains stable. In nowhere else is this more apparent than in the genre of rhythm games. Yes, stagnant design and mechanics run rampant through all genres, but at the very least, the progression of technology has allowed for new approaches to the same content. The rhythm game — despite all of the advances in technology, and in fundamental game design practices — has remained largely consistent throughout its lifespan. By no means is this is a slant against the rhythm genre, it’s a unique gameplay experience that I personally revisit frequently, but it does stand as an important distinction from more prominent genres. Rhythm, and by extension, music-based games occupy a certain niche, one that is seemingly dwindling. While I can’t make any claim that this is due to the rather static gameplay elements that the genre is identified by, it’s likely to have played a part. However, by the same token, it’s this predictability that makes the rhythm genre appealing, and indeed, endearing. All other genres are identified by staple mechanics; platformers are built around running and jumping, the traditional JRPG centers around turn-based combat with certain character roles, and so on. These associated traits and mechanics were shaped through repeated iterations. The popular traits stuck around, used and reused until they became second-nature; assumed components of any given genre. The rhythm game however, has its roots outside of gaming as a whole. The ability to keep a beat, to follow rhythmic patterns and respond in kind is not strictly related to gaming. It occupies a neat little overlap between cultural and entertainment spheres. It’s an innate human ability, albeit one that some struggle with more than others. Those with a passion or predisposition for such endeavors will have no trouble acclimating, with their skills transferring neatly to the gaming equivalent. The same could scarcely be said for other prominent gaming genres, which is certainly a point in favor of the rhythm game; they’re accessible in a way that gaming at large generally isn’t. With that said, it’s because of this simple connection to an external skill that the rhythm game has no real room to develop. Outside of the rhythm-matching pattern popularized by DDR, Beatmania, DJ MAX, Guitar Hero, and countless others, where else is there to go? 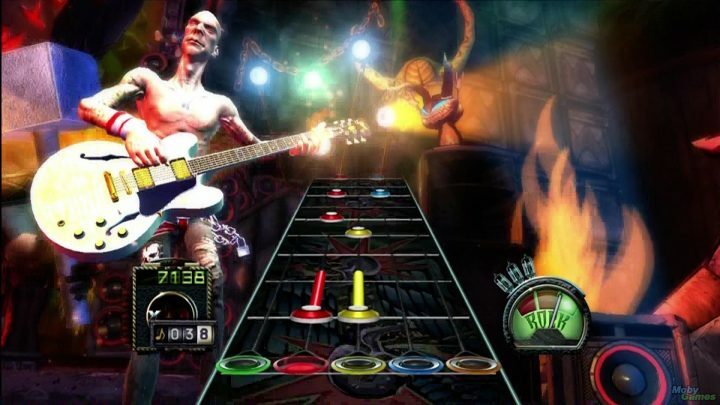 Following the lead of Guitar Hero and its contemporaries, the genre could tread the path towards more practical applications of musical abilities. Emulating an instrument in video game form is a neat concept, but it often falls short in execution. After all, if you’re able to play an instrument with some semblance of skill, there’s likely no need for a video game to assist you. More often than not, control is simplified, though there is certainly an argument to be made for video games as a teaching tool. So then, if rhythm games are fundamentally archaic and unchanging, static time sinks designed to test our innate abilities to replicate patterns, why does the genre persist? Simply put, they thrive on our desire to push our limits and prove our skills. The rhythm game is built around repetition. A perfectly surmountable, yet challenging trial is placed in front of you, and you have naught but your personal abilities to guide you through it. Failure is inevitable, yet so is success, and with success comes the next goal. It’s a system all too familiar among the gaming medium, with such simple feedback loops driving all manner of titles, across all manner of genres. It’s at this point that I would like to point out the diminishing support for the rhythm genre from developers. While it’s true that the genre was never particularly strong on home consoles, instead staking its claim primarily on the arcade market, the number of titles making the jump seems to be shrinking. Perhaps this is a reflection of the strong arcade-focus of the genre at large, prioritizing short bursts of entertainment and challenge, designed to entice that ‘one more try’ mentality in its players. 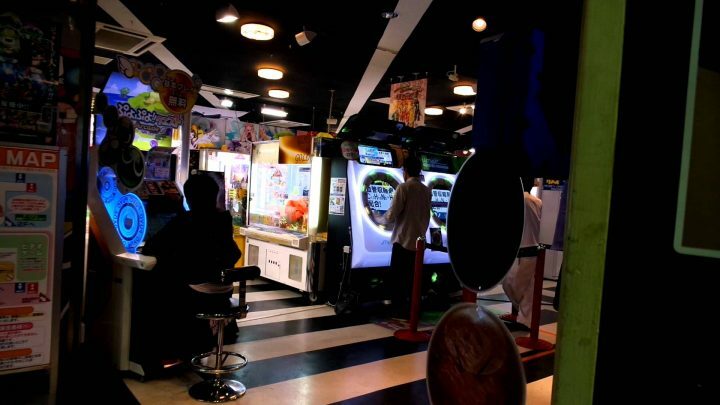 A visit to any arcade, particularly in Japan, will show just how successful this approach is to the right market, but evidently, the home console market is not quite the right fit. However, I feel that changing this focus would be detrimental to the genre at large. The appeal of rhythm games is in their simplicity. You can dress up the mechanics as much as you like; you can add a zany, ridiculous story, but at the end of the day, a rhythm game is simply that. The focus should be on keeping the action engaging and responsive, and creating a challenging, yet rewarding experience for the player. The arcade-like focus epitomizes this approach, with short and sharp bursts of challenging gameplay. A rhythm game is at its best when it provokes the player, when that end goal, or that perfect run feels within reach, but suitably evasive. As long as that tight balance is maintained, nothing else is quite as important. 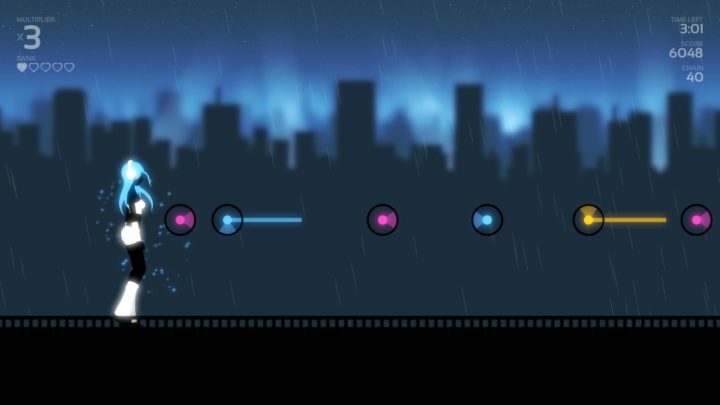 There’s been a trend of late, particularly among the PC market, of procedurally-generated rhythm games. The idea of being able to play along with any and all of your favorite songs is immediately appealing, though the nature of procedurally-generated content makes this unstable ground at best. When it works, catching that massive drop on Audiosurf or nailing that pumping bass line in Melody’s Escape is utterly enthralling, but the unfortunate reality is that you’re just as likely to create a miss as you are a hit. It’s at this point that I’d turn to community-generated content, like Osu!. With a variety of game types emulating popular entries in the rhythm genre, and a vast catalog of user-made stages calling on every possible genre of music, there’s always an exciting, new experience waiting in Osu!. The fundamental principle here remains the same as in the more commercial rhythm genre: simplicity is key. While it’s certainly true that the gaming industry is in dire need of some innovation, I think it’s equally important that we acknowledge the finer intricacies of the medium. Sometimes, the simple approach is the best one, and if that means reapplying similar ideas in new contexts, then I think that’s a worthwhile endeavor. As the industry at large is shifting towards bigger, more expensive things, the rhythm genre remains a tight, intimate field. While the window-dressing may be different between Elite Beat Agents and Project Diva, the experience at the end is the same. Whether that’s a good thing or a bad thing depends on your individual perspective, but I believe that the rhythm genre will always have a small, yet crucial place in the gaming industry.